Number five in our Four + 1 series is my good friend Al Golub, coming to us from the Sierra-Nevada foothills of California. You can find Al on his website and Twitter. A former Chief Photographer and Director of Photography at the Modesto (CA) Bee, Al has pictures spanning decades and continues to shoot NFL football, California’s wildfires, and more. He also has the distinction of being among the very few people who can talk down Angry Matt, having accomplished this feat on a few occasions. His dedication to passing along the knowledge he has accumulated is one of the reasons I joined Big Lens Fast Shutter. Like many photojournalists I was a high school newspaper and yearbook photographer. Starting with my first football game I was hooked on sports photography. Football was my favorite and remains to this day, I am still covering 49ers and Raiders after all these years because of that excitement I learned in high school. Photography has never been a job to me, it has always been a passion that drives me to photograph. I was so focused on getting the peak action that I forgot to photograph the reaction after the peak action. I worked out a little mantra to myself “ action reaction”. I repeated action-reaction, action-reaction and so on. It seemed to do the trick but I would say it out loud in the beginning causing my fellow photographer to tell me to shut up. 3. Funniest/Strangest story from on of your shoots? My first football game I photograph was in fall of 1958. It was my first time using a 4×5 Speed-Graphic and of course we made several test in my backyard at night. Things like cocking the shutter and pulling out the slide then remembering to flip the slide to black before removing the film holder weighed heavy on my mind along with the weight of the Honeywell 208b strobe unit that slowed down everything. Well to the punch line, I didn’t know anything about the wire sports finder or how it worked. I used the optical viewfinder during the game. Like the mirror on your car thing may appear further than they really are. I discovered this when a ball carrier came around my side of the field as I was trying to compose by filling the viewfinder. I looked up after the shot and fell backwards as the players rolled over my feet. My dad got to use his favorite joke as he yelled to me from somewhere down the sidelines, “Come over here kid and I will pick you up!” Dad and the Denver Post photojournalist came over to check me out. The Post photographer said “Hey kid you need to learn how to used the sports finder”; he also gave me a quick lesson in how to Near-Far focus the Speed-Graphic and use the wire sports finder. I got a great image but I decided to be more aware of my surrounding and stay clear of running football players. 4. Advice to kids (or a midlife crisis sufferer) who are aspiring to become a sports photographer? Minimum requirement is to be an excellent photographer. Know your equipment and software in and out. Talent is only the first step. The most successful photographers have learned how to promote themselves and keep good relationship with others; you must know what you are getting into. Having a good working knowledge of your chosen sport and continuing to build on that knowledge is very important. You need to know what you want to accomplish and stick to it. Have a long-term and short-term goal, along with an exit plan. A career in photography is not for the faint hearted. It is difficult to make it in an industry that requires expensive equipment to make minimal money. To deal with midlife crisis or burnout, you must got back to the basics of why you became a sports photographer and what you planned to accomplish? The bigger questions “are you happy” and do you feel a sense of accomplishment me every time you photograph are important. The quality of any photograph is directly proportional to the energy and attitude of the photographer. Enthusiasm and positive mind set makes for great images. To me, photography is never a job it is my passion and way of life. Because photography is part of me, I am just as enthusiastic about photographing a simple assignment like dog of the week as photographing more complicated assignment like the Super-Bowl. You need to approach every opportunity to photograph with an open mind or you won’t see that great image. +1 You’re in the middle of a massive film-scanning project (years work of 49ers pictures). What have you learned, and what is your goal with this project? I am about three quarters the way through scanning 20 years of 49ers and Raiders film. I hope to be finish by the end of March. I have already made 3,000 scans which produced 2600 final color corrected and captioned digital files. It is an all-encompassing time consuming project. 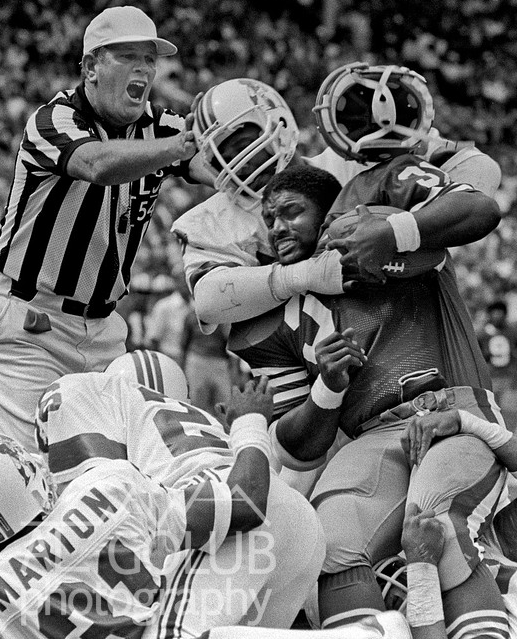 My short-term goal is to get all 32 years of my bay area NFL images on PhotoShelter. It should end up about 5,000 images or so. My long-term goal is to get all of my editorial and art type images on to PhotoShelter. I learned how to organize, research, and establish a workflow for this type of project. You have to stay on task; while I am writing this note I have two scanners going on in the background. I am in the middle of 1997. My blog on hold but when I finish, I will blog about how I went about getting this done. If you would like to see what I have completed so far check out my PhotoShelter NFL gallery page.